"I GREETED HIS TOMBSTONE THE WAY I ALWAYS DID - WITH A SWIFT KICK." 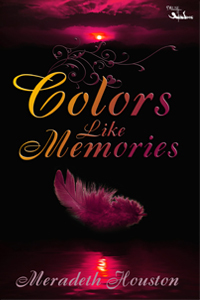 Hey guys, today we are featuring Colors Like Memories by Meradeth Houston! We love the book description, it gives you enough info to set the book and at the same time makes you want more. Also the cover is pretty eye-catching. She’s a Northern California girl. This generally means she talks too fast and uses "like" a lot.